So your apartment is infested with bed bugs, you’ve talked to the landlord and they’ve basically done nothing. You’re so fed up, your going to move out and leave those bed bugs behind! Unfortunately it’s not that simple. I seriously don’t blame you for wanting to move out and can only imagine the frustration of living with bed bugs and your landlord not doing anything about it. The problem with moving out is that the bed bugs will move with you. In order to move out, you first must address the bed bug problem in your apartment. See, bed bugs aren’t just in your apartment, they are most likely in your mattress, box springs, pillow, furniture and even your clothes! While moving out to another place may leave some of the bed bugs behind, others will just travel with you and you’ll still be dealing with bed bugs in your new place as well. Before you can move, you have to rid your home of the bed bugs. Speak to your landlord, and continue to until the problem is addressed. Talk to other residents where you live and see if they have issues. Expect to have to push a little, as there is a social stigma with bed bugs, and people won’t always be open to admitting they have them. But if you can get a few residents to agree, the voice of multiple people over just one can be powerful. Showing that an entire apartment complex is infested can also go a long way to getting your landlord and health departments attention. If you spoken to the landlord, and they haven’t addressed the problem, call your local county health department. With the recent growing reports of bed bugs, most county health departments are all over bed bug reports. They will force your landlord’s hand. Treat the problem yourself. I know if you’re renting, this isn’t something you really want to do, but in a pinch it’s certainly an option. You can read about how to treat your bed bug problem on our treatment page and also read about bed bug sprays. Engage a professional exterminator to resolve the issue. Then take your landlord to court for reimbursement. There is some risk you may end being responsible for the bill. This option should only be used if you really need to move and the problem needs to be dealt with right away. Once your problem is finally solved, we would highly recommend purchasing bed bug mattress covers and box spring covers before you do. Mattresses are one of them most difficult areas to effectively treat. 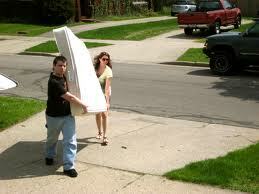 Bed bug mattress covers lock bed bugs in and they eventually stave and die. If sleeping on a mattress full of dead bed bugs doesn’t appeal to you, we would recommend purchasing a new mattress and box springs and putting covers on those to minimize the risk of infestation again. When you move into your new place, take active bed bug prevention steps to keep from getting infected again. Even though you might feel confident all the bed bugs are gone, it only takes a few traveling along with you to start another infestation. Taking preventative steps will keep you from having to deal with those bed bugs all over again!